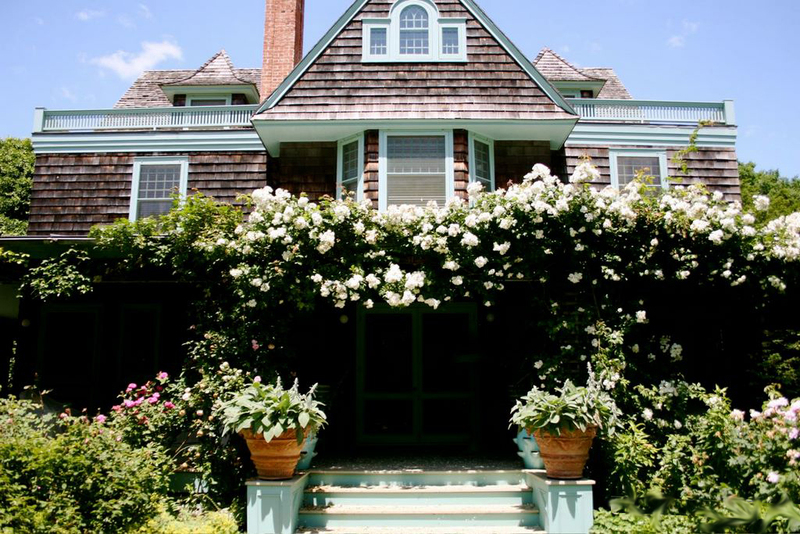 Perhaps Martha Stewart's second most famous home is the one on Lily Pond Lane in East Hampton on New York's Long Island. She bought the home in 1990 after her divorce from Andy Stewart. Featured in many issues of her magazines and in her books, Lily Pond Lane, like Turkey Hill, was the inspiration and laboratory for many of Martha's business ventures, such as a line of paint colours and furniture with Bernhardt called Martha Stewart Signature. The three-story house sits on just one acre of land, giving Martha a somewhat restricted parcel when compared to the hundreds of acres she owns elsewhere. Martha completely redesigned the landscape of the property and divided the plot into new outdoor rooms, separated by arbors, hedges, pathways and flower borders. "I was attracted to its quiet, serene appearance, and though most of the houses were tucked behind privet barriers, some of the gardens were fully exposed. The most wonderful one was on the pond itself. It was breathtaking. I stood and gazed at the profuse and colourful flowers, making mental notes of the types that were blooming so perfectly - dahlias, salvias, asters, daisies and roses." Thirty years later, Martha had her own home on this lovely street. Martha has completed an extensive renovation of the shingle-style summer home, which had been badly neglected. She has grown sumptuous gardens of climbing roses around her front porch and big patches of purple hydrangeas. There are over 1,800 tulip bulbs planted on this relatively small lot. The interior features large, open rooms with hardwood floors and big, bright windows. The six bedrooms play host to numerous guests in the summer who have only a few minutes to walk to the local beach. Martha's neighbors here include Billy Joel, Steven Spielberg and Calvin Klein. The dining room overlooks the back gardens. Martha's collection of McCoy pottery is elegantly displayed on floating shelves in the dining area of the kitchen. 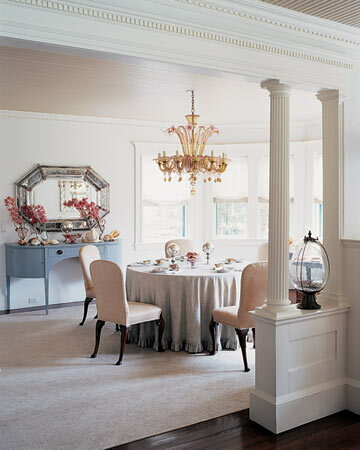 Gleaming hardwood floors and classical architectural details add a sense of formality to this parlour. I love Lily Pond Lane - it's my 2nd fave of Martha's homes after Turkey Hill. My question is whether she actually lives there as much as she used to, or at all, in fact. She used to be a East Hampton regular, but that was many years ago, before she purchased her Skylands estate, and now her Bedford property, where she spends most of her time. Also, was the kitchen on her old tv show the replica of the kitchen in Lily pond lane? she had two kitchens on the show - one was the duplication of the one in Turkey Hill, and for some reason, I always thought the other one was designed to be like the one in her Hamptons home. Thanks! No, Martha doesn't spend that much time in the Hamptons these days. Although she does more so in the summer than any other season. But, she still makes it there occasionally. The TV studio kitchen with the darker wood was based on the Lily Pond kitchen, yes. The one with the lighter wood is the Turkey Hill model. Does she have tennis courts? She doesn't have tennis courts here. But she does have tennis courts at Bedford and Skylands. I was in the home on Lily Pond Lane a few years back and wonder why all the beds lined up on either side of the upper most floor ? Anyone know the history of this house ? Thanks . I was in the home on Lily Pond Lane a few years back and wonder why all the beds lined up on either side of the upper most floor ? It reminded me of a hospital room circa 1850! Anyone know the history of this house ? Thanks .